The Caribbean island of Providenciales (Provo for short) is best known for the beautiful 12 mile long white sand beach on Grace Bay and the diverse diving opportunities. The island is easy to get to with daily nonstop flights from several US hubs. You'll find a wide range of lodgings from boutique style inns to luxury condos and expansive resorts. If you enjoy a variety of dining experiences, you'll find everything from fish shacks on the beach to sushi and extraordinary European cuisine on Provo. What you won't find is a single fast food or US chain restaurant! Dive operators offer 2 tank morning and single tank afternoon dives. Dive sites along Grace Bay are just a few minute boat ride from the marina. These shallower sites offer spur and groove coral formations where you may share the reef with turtles or wild dolphin. Divers can also dive familiar locations like NW Point, French Cay and West Caicos with their dramatic walls, schooling fish and chance for large pelagic encounters. These sites require longer boat rides, but are well worth the trip! When not diving, there is plenty to do topside with parasailing, wind surfing, kite boarding, stand up paddle boarding, fishing, kayaking, sailing and other motorized water sports. For those preferring drier activities Provo offers golf, tennis, mini golf, horseback riding, shopping and a number of amazing spas. Grand Turk, the tiny island capital of the Turks & Caicos, has a population of just 4,000. This laid back island still has hard packed dirt streets where wild donkeys, goats, chickens and dogs may share your stroll into town. Accommodations tend toward more intimate guest houses or established small hotels, with a few private home rentals available. The local dive sites are on the Grand Turk Wall that begins about 100yds off shore and runs parallel to the island. A few sites are accessible from shore, but most dives are accessed by boat. During the winter months, divers may hear whale song on their dives and spend their surface intervals watching for whale spouts. Top side you can de-stress while listening to the waves lap the shore, visit a maritime museum, explore a light house, or swap stories around the pool or bar. There are only a few restaurants on the island, most featuring incredible seafood dishes and some have nightly entertainment. Keep your eye out, the local troubadour may be the same person who lead your dive that morning! Want to dive it all? Then consider a live-aboard vacation. - AAggressor Fleet offers 7-10 day cruises between Provo and Grand Turk that allow you to dive all the best sites the Turks and Caicos have to offer. Please contact the adventure experts at Island Dreams to discuss the best option for your diving needs. 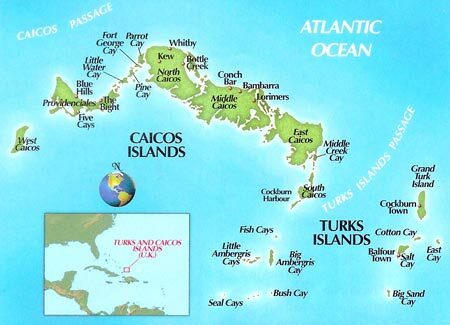 Island Dreams' dive travel agent Yvonne Oyler is certified as a Turks and Caicos Travel Specialist. Let her help you to create the Turks & Caicos package that best suits your needs and expectations. LAND-BASED OPTIONS - Island Dreams works with a nice assortment of dive hotels, with options for both Providenciales and Grand Turk.